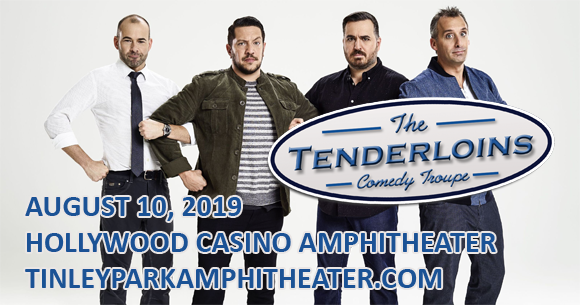 The cast of TruTV's Impractical Jokers comes to Hollywood Casino Ampitheatre on Saturday 10th August 2019 on their Cranjis McBasketball World Comedy Tour! The lifelong friends and comedy troupe, known as The Tenderloins, will bring their hilarious shenanigans to the stage, showing off their impeccable improv chops in this wild and riotously funny show! Get ready for some world-class hi-jinx! The cast of Impractical Jokers is an American sketch and improv comedy troupe known as The Tenderloins, formed on Staten Island in 1990 where the comedians met at high school. Currently composed of Joseph "Joe" Gatto, James "Murr" Murray, Brian "Q" Quinn, and Salvatore "Sal" Vulcano, the group made its name in the early 2000s performing live comedy and found further popularity via YouTube, MySpace, Metacafe, and other websites, where their recorded comedy sketches amassed millions of views. Winning the NBC It’s Your Show competition for the sketch "Time Thugs" in 2007, the group walked away with a $100,000 grand prize and an even larger fanbase. Their popularity soon led to a television deal for a scripted comedy pilot with Spike TV based on the comedians' own lives. Despite never coming to fruition, Spike TV's interest led to another deal with truTV, and in 2011 the network announced Impractical Jokers, a new series executive-produced by and starring The Tenderloins. Running for eight seasons so far, the show has also produced three spin-offs (Jokers Wild, Inside Jokes and After Party) and will be the basis of a feature-length movie, due for release in 2019. In addition, The Tenderloins have a popular radio show and podcast.